There's something awfully satisfying about kicking off a new season of theatregoing at the Shakespeare Theatre. After a long and stultifyingly dull summer, at last!- back to what I love. And what better way to start their 25th Anniversary Season of comedies than with a new David Ives transladaptation (his term, not mine) of a classic French comedy? "The Heir Apparent" is an evening of great fun. I've spoken here on several occasions about the perils of modern verse adaptations- it's a delicate and tricky balance between making clever rhymes and falling into the overly self-consciousness. By and large, Ives succeeds in finding the balance between having fun and keeping the sense of things. He's also been very wise in how he's adapted events in the plot, particularly as he finds wonderful new moments for the talented cast assembled by director Michael Kahn. Let's do speak of that cast. Floyd King's marvelously contorted face on the cover of the playbill is a glorious preview of what's to come. As ever, King has superb comic timing and displays masterly ability to raise a laugh with one long look or twitch of his face. He's well matched with Nancy Robinette; the only flaw in her performance is that there isn't more of it to enjoy. There are also a trio of newcomers that deserve special attention in their STC debuts. Carson Elrod is, as they say, a hoot and a half (or do only I say that anymore?) as the witty and wily servant Crispin. Elrod is able to boom across the stage in larger than life disguises just as easily as he can dial his performance back down to normality and still hold the audience's attention. 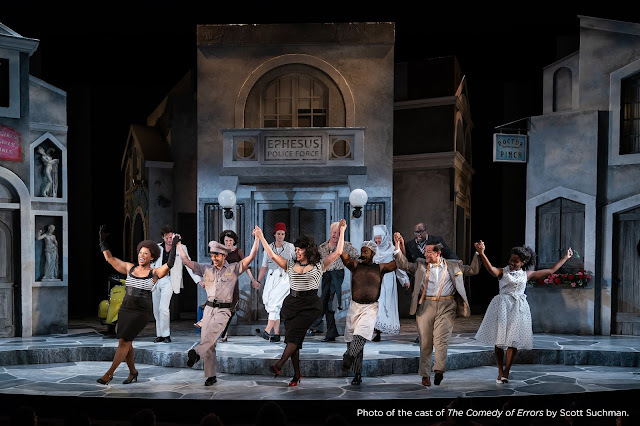 Andrew Veenstra as Crispin's employer, Eraste, more than holds his own in a role that might otherwise be overwhelmed by the size of the other comic performances on stage, and Kelly Hutchinson provides the necessary grounding in reality as the servant Lisette. If I had my druthers, I'd love to see these actors return to the STC stages in future productions. For those familiar with their work, it should come as no surprise that the design of the show is fantastic, from Alexander Dodge's sets to Murell Horton's costumes. Michael Kahn's direction shows why he's earned his reputation in American theatre, and why his classical theatre company has thrived for twenty-five seasons. Well done, Mr. Kahn, and I can't wait to see what comes next. For all of our readers searching for a fun night out that combines high art and scatalogical jokes (and who ISN'T in the mood for that? ), "The Heir Apparent" is just what you've been looking for.